It's Friday afternoon and, while that's no guarantee of where (or when) you'll be reading this from, as far as I'm concerned, it's a time for relaxing. And what better way to enjoy the end of the work week than with a bunch of cars smashing all up into each other? Alternatively, what better way to take out your still-working frustration, than with a bunch of cars smashing all up into each other? 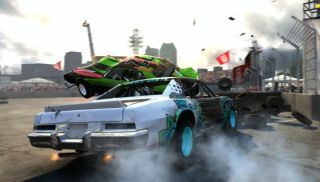 That's what you'll get with Grid 2's Demolition Derby update, which has now been trailerated. The Demolition Derby update, which you can read about here , is out now.